Exporter of a wide range of products which include lenvatinib capsules and enzalutamide capsules. 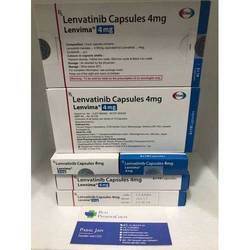 Lenvatinib (trade name Lenvima) is an anti-cancer drug for the treatment of certain kinds of thyroid cancer, and potentially for other cancers as well. It was developed by Eisai Co. and acts as a multiple kinase inhibitor against the VEGFR1, VEGFR2 and VEGFR3 kinases. 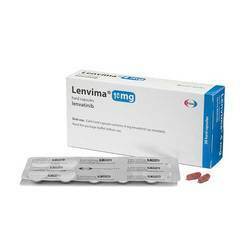 LENVIMA (lenvatinib) is a prescription medicine that is used to treat certain kinds of cancer. Lenvima (Lenvatinib) is a prescription medicine that is used to treat certain kinds of cancer. 1) Thyroid cancer: Lenvima is used by itself to treat differentiated thyroid cancer (DTC), a type of thyroid cancer, that can no longer be treated with radioactive iodine and is progressing. 2) Kidney cancer: Lenvima is used along with another medicine, everolimus, to treat advanced renal cell carcinoma (RCC), a type of kidney cancer, after one course of treatment with another anti-cancer medicine. Oral use : Each hard capsule contains 4 mg Lenvatinib. Need the package leaflet before use. 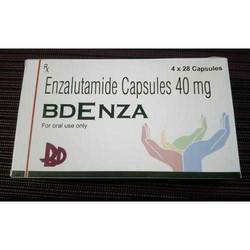 Enzalutamide, sold under the brand name Bdenza, is a nonsteroidal antiandrogen (NSAA) which is used for the treatment of metastatic, castration-resistant prostate cancer (CRPC).